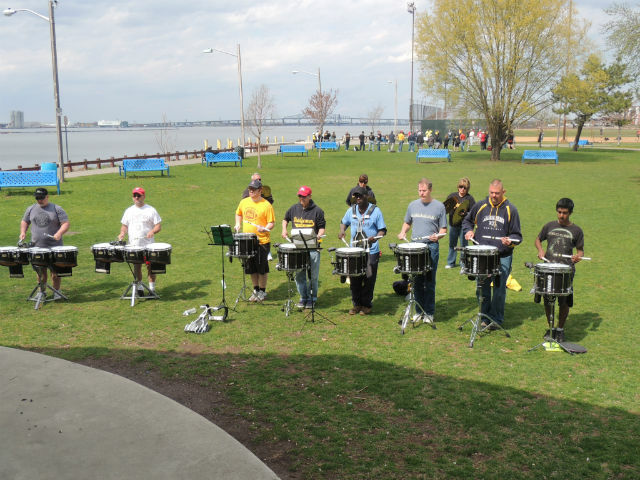 On a visit to 16th Street Park last weekend, I took some time to visit with the Bridgemen who were in the midst of their first outdoor rehearsal of the season. The first thing that came to my mind was how much fun they seemed to be having, considering the amount of work that they were getting done. They spent most of morning in the parking lot by the boat launch working diligently on learning their “drill”. 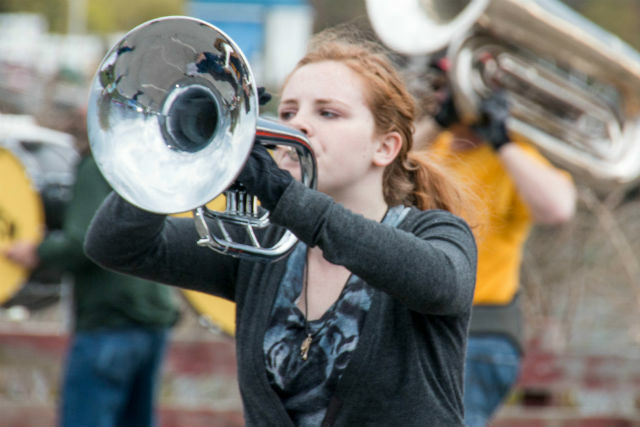 The drill, as it is called, is the staging or choreography, which is the part of the program that makes drum corps and marching bands different from other forms of musical entertainment. The performers are required to move around the field, in step with one another, maintaining shapes as well as the spacing between one another. They move around with great precision, to create a variety of shapes or pictures that create focus and emphasis that lead the viewer’s eye through the show. After the morning session, the corps sat around the park and ate lunch. It was impressive to see some individuals break away from the group to work alone on their music. I was astonished by the work ethic of the membership, as well as the resourcefulness as it was incredibly windy down by the water. These folks don’t get paid a penny for what they do. In fact, they have to pay a membership fee and participate in fund raisers to be part of the group. Before the lunch break was even over, members in the percussion section started the afternoon rehearsal block. The “pit” as they are known, began working on part of their show music. This section is made up of a variety of stationary percussion instruments. It is the only section that doesn’t march or participate in the drill. They perform from the front sideline, embellishing the field music with two complete drum sets, a Latin percussion rack, marimba, concert bass drum and a plethora of accessory percussion instruments. The marching percussion, or batterie, looks and sounds very strong. With six snare drums, three multi tenors and a five tonal bass drums. This section is truly the heartbeat of the corps. Most fascinating to me was the bass drum section. 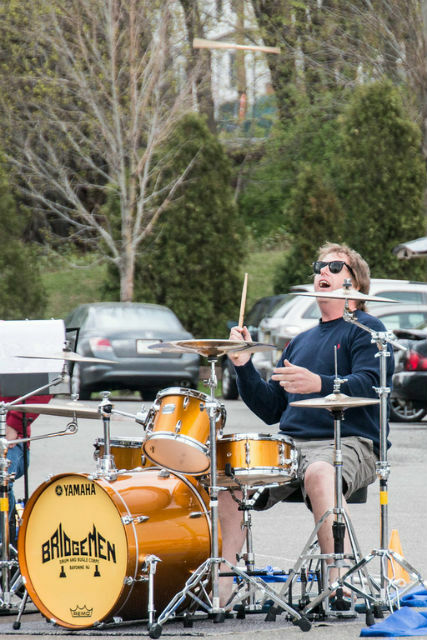 When most people picture the bass drummer, they picture the constant thud, thud, thud that keeps the band in step. 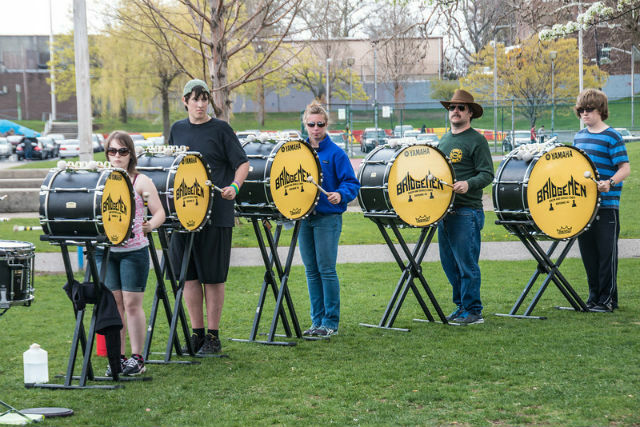 Well, this is not your father’s bass drum line. Comprised of five drums that are tuned to different pitches, individuals in this section work together creating a vast array of rhythmic and melodic combinations that gives the impression that you are listening to a giant drum set as opposed to 5 individuals. Another amazing thing to behold is the tenor section. These players carry a rack of 5 drums each. It’s truly memorizing to watch the synchronization of their hands as they criss-cross and move all over these drums in perfect time. There are also 3 individuals that carry huge cymbals. These are used for musical accents but they are also held up for the other drummers to “ride” on as a set drummer would. It’s really quite remarkable. The snare drum is the lead voice of the drum line. I was amazed at how many different sounds and volumes that they get out of a single drum. I took a short walk across the park and found myself in front of a huge arc of brass players. There had to be, at least, 50 of them. They had horns of every shape and size from a small trumpet-sized horn (called a soprano), to a humongous tuba-like instrument known as a contra bass. I was advised not to call them tubas. The voices are similar to a choir. They use soprano, alto, baritone and bass bugles. After playing a series of warm-ups and exercises, the horns broke off. In to smaller groups to work on various parts of their program. About 45 minutes later, they returned from their sectional rehearsals and played together, creating an incredibly majestic sound. I wasn’t done quite yet. The last section that I visited turned out to be the most impressive. 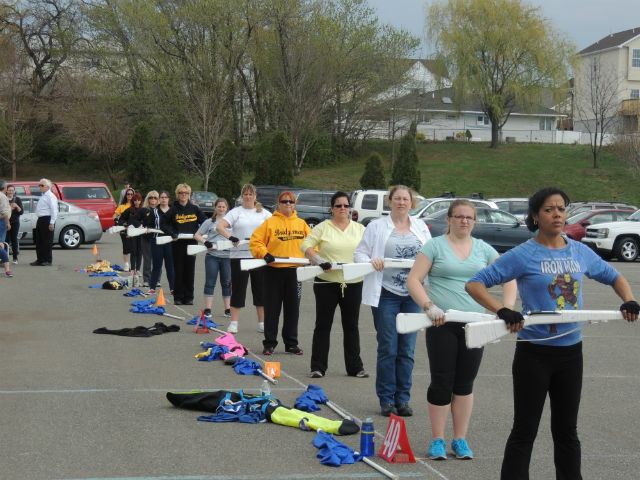 The color guard is made up of 16 ladies that spin flags and mock rifles with incredible accuracy. They also add another level to the program with dance moves. Their rehearsal appeared to be the most intense. The teacher seemed to run a pretty tight ship. His comments and drill instructor like instruction was cutting and sarcastic at times but the girls seemed to take it in stride. It appeared to motivate them. His assistants were just as tough as these two women barked out corrections and called out individuals. I was thinking, “these girls actually pay to get beat up like this on the weekends?” It really paid off though as I watched them learn a segment of their routine and run it several times. Then, they each did the move, one after another in a “ripple” as they called it. I was thoroughly impressed. They spent about 30 to 45 minutes learning a routine that lasted for just 12 counts. That equates to like 5 seconds out of a twelve minute show. I was exhausted after just watching the corps for just a couple of hours. Keep in mind that they started 3 hours before I got there and continued on for 3 if 4 more after I left. Then they did it again on Sunday! Now, they all go back to regular life for a week or two until they come back to do it again on the 18th of May. If you get a chance, I highly recommend coming down to 16th street park to witness this highly motivated group of wonderful, friendly and hardworking people. If you want to see these folks do what they do in uniform, under the lights. 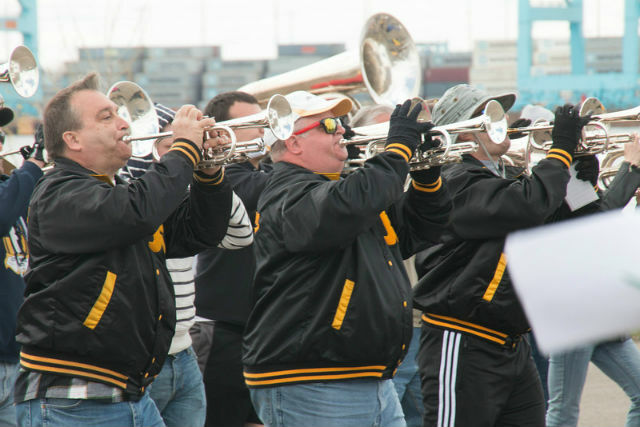 Make time to see them and some other great drum corps at the Tournament of Stars on June 21st at Veterans Memorial Stadium at the foot of 25th Street in Ol’ Bayonne. For ticket information, you can visit the corps website www.bridgemen.com or call 862-216-2407. Posted by News Editor on Thursday, May 1st, 2014. Filed under Current News, DCA News, FrontPage Feature.